In a city that is all about indulgence, it’s no surprise that an itinerary for 3 days in New Orleans will lean heavier toward food than sightseeing, toward music than monuments, and toward meandering rather than long checklists of things to do. New Orleans is all about the good times–and however you define the good times, you’ll find them here. 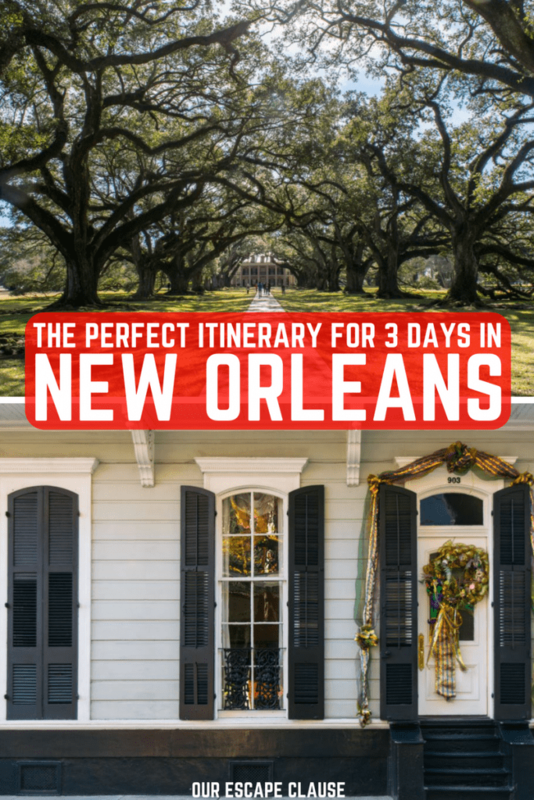 If this is your first time in New Orleans, don’t worry–this 3 days in New Orleans itinerary will make sure that you have more than enough time to see its most famous sights, learn a few things about the history of the city, indulge in whatever it is you hope to indulge in here, and to eat far more beignets than any one human being should. That being said… New Orleans is not a place that can be checked off the list. This is a city that devours you, and I can virtually guarantee that you’ll leave wanting to come back. More Time in New Orleans? Start your day in Jackson Square. 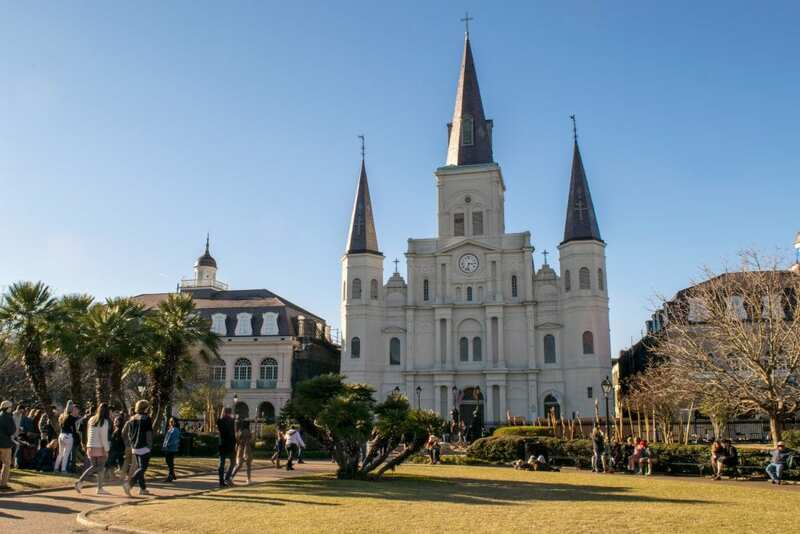 If you’ve seen photos of New Orleans, you’ve likely seen Jackson Square: a small park that sits in front of St. Louis Cathedral, the view of New Orleans’ beautiful white cathedral is one of the most classic shots of New Orleans. It doesn’t take long to walk around, but the real treat is what’s between Jackson Square and St. Louis Cathedral: in this small walking area, you’ll often find energetic street performers, from jazz musicians to jugglers, as well as plenty of people willing to exchange a bit of touristy New Orleans voodoo for a fee. The area is lively, exciting, and definitely a great first stop in New Orleans. Head into Cafe du Monde. 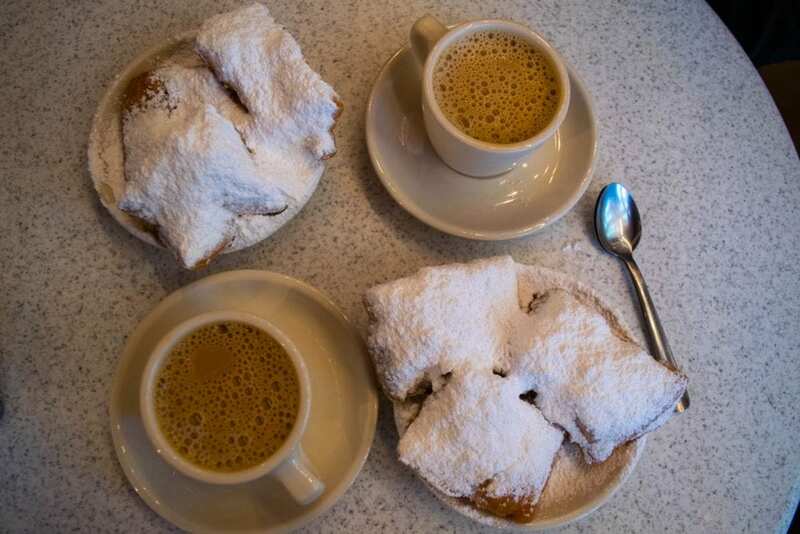 Just a short walk away (essentially on the opposite side of Jackson Square as the St. Louis Cathedral) sits the famous Cafe du Monde, home to French-style beignets (fried doughnuts topped with a literal inch of powdered sugar) and a cafe au lait. The menu is very small–beignets are the only food that they serve, though there are a few other drinks on the menu–and very reasonably priced, with a plate of three beignets and a drink coming out to $6.00 USD even (cash only, though there’s an ATM hidden in a tourism office across the street) as of the time of writing. At prices like that, don’t feel guilty if you end up stopping by more than once during your 3 days in New Orleans! Stroll along Decatur Street & the French Market. Decatur Street is, in many ways, one of the main drags of the French Quarter, and is home to some of New Orleans’ most popular restaurants (don’t worry, we’ll get to those in the food section below). You can also find souvenir shops, tour companies, donkeys hooked up to carriages offering rides, and just about any other tourist staple you can think of here. Be sure to duck inside the French Market that runs parallel to Decatur Street for several blocks to do a little souvenir shopping! New Orleans is all about meandering: the French Quarter is one of the most picturesque neighborhoods I’ve ever seen in the USA, full of beautiful architecture, bustling street life, and plenty of bars, candy shops, restaurants, and more urging you to indulge in them. We spent hours walking the streets of the French Quarter taking photos, people-watching, ducking into bookstores, and picking up tasty treats. 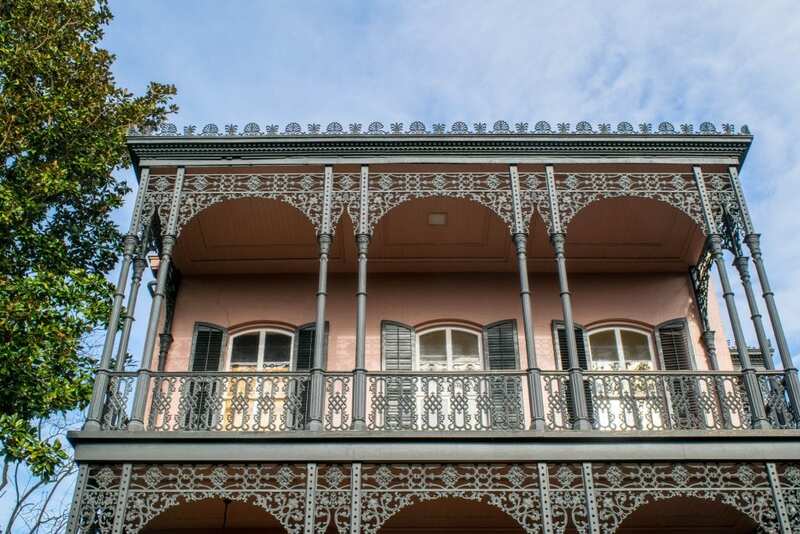 If you want a bit more of a structured look at the history of the Quarter, consider booking a walking tour–prices are very reasonable, and they’re a great way to get an initial overview of New Orleans. In New Orleans, even simple walking tours of neighborhoods can be personalized! Shop Pirate History Tours, Drunk History Tours, and Food History Tours–all revolving around the French Quarter, of course. Take your pick for nightlife: Bourbon Street or Frenchmen Street. New Orleans is famous for its nightlife, and no New Orleans itinerary would be complete without including it: this isn’t a place to call it quits and head back to the hotel after dinner. 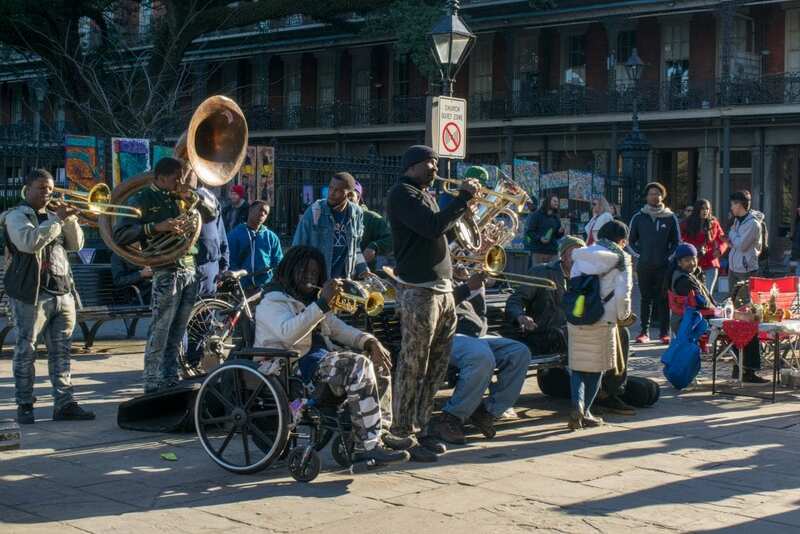 The French Quarter offers tons of nightlife, but by far the two best-known streets are Bourbon Street (known for raucous partying and debauchery) and Frenchmen Street (known for live jazz playing in all of the clubs every night of the week). Personally, we find Frenchmen Street to be more our style, but if you’re unsure, there’s no harm in checking out both! Head out of town to visit a plantation. For your second day in New Orleans, it’s time to get out of the city: while NOLA is an amazing city, its surrounding areas are not to be missed. 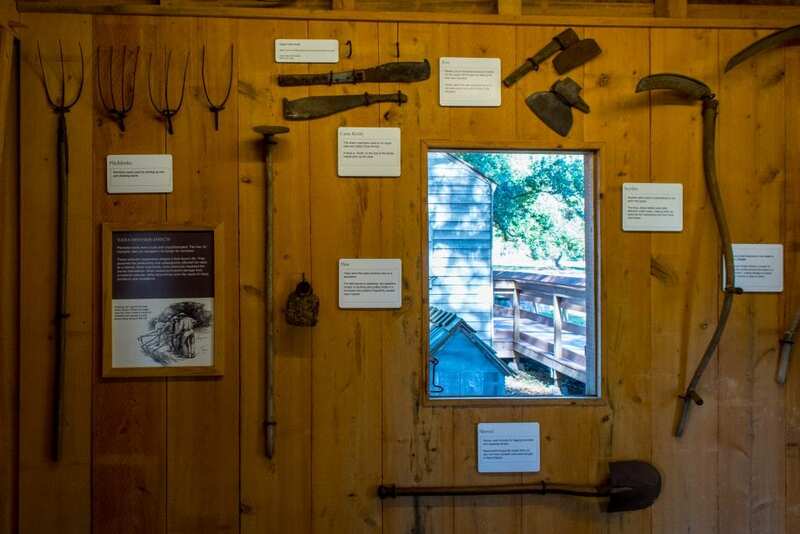 Start your morning by heading to a plantation for a tour and a peek into some very sad history: needless to say, the New Orleans area has plenty of plantation museums to choose from. 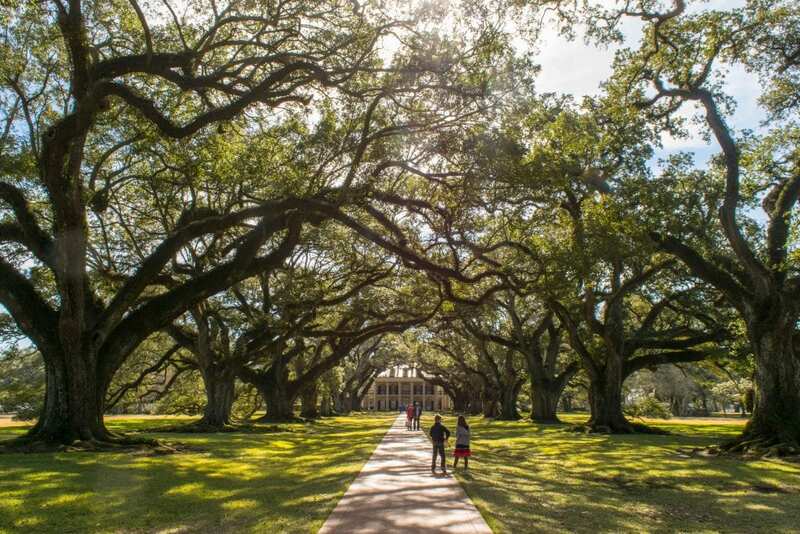 We chose to visit the Oak Alley Plantation, admittedly partly inspired by the absolutely gorgeous tunnel of 300-year-old oak trees that line the path to the house–and wow, did they ever live up to expectations. That being said, Oak Alley also did an excellent job covering both the glamorous and indefensibly horrible parts of plantation life, including stories, documents, and displays covering the lives of not only the wealthy family who owned the plantation but also the people enslaved there. Sadly, that balance is not a guarantee–some plantation museums have a tendency to focus too much on antebellum glamour rather than telling the whole nasty story. 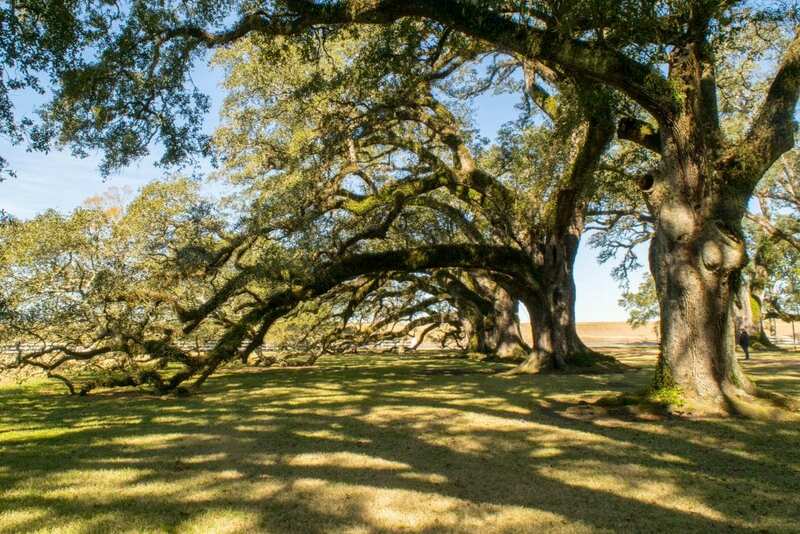 Other plantations in the area to consider are the Laura Plantation, the Houmas House Plantation, the Nottoway Plantation, and the Whitney Plantation, among others. The Whitney Plantation is newly renovated and has an exhibit that focuses on the children of slavery that is said to be deeply moving and emotional. Spend the afternoon in the bayou. 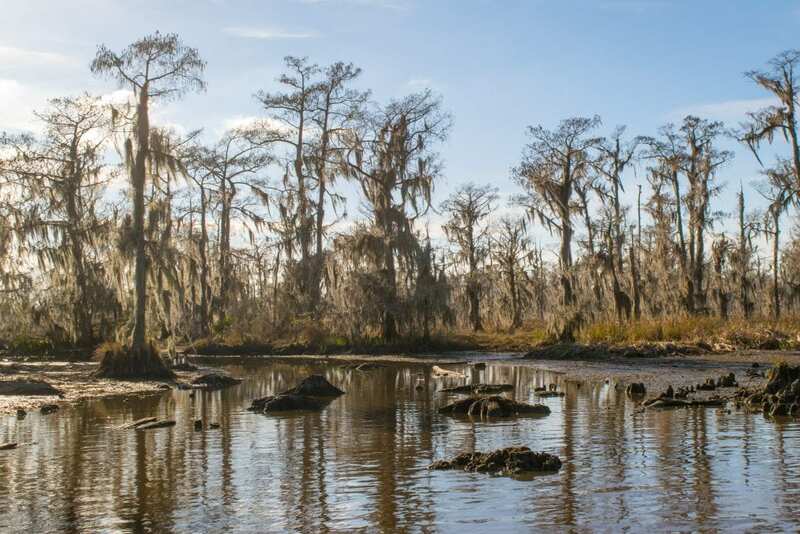 As the highest point in Louisiana (so-called Driskill “Mountain”) reaches a mere 535 feet above sea level, it’s no surprise that Louisiana, and especially coastal New Orleans, are home to significant amounts of wetlands. 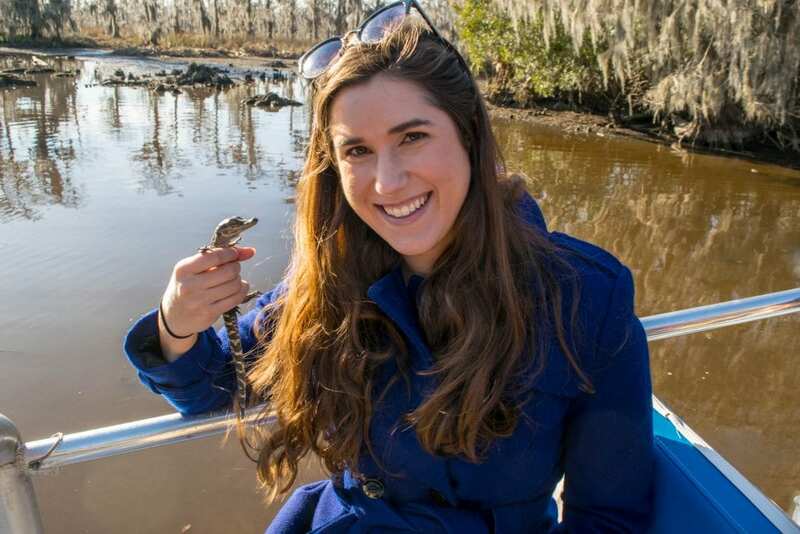 Home to cypress swamps, interesting wildlife, and a fragile ecosystem, it is definitely worth a trip outside of New Orleans to see the nearby bayou. We spent an afternoon on the bayou traveling by airboat, which was a very fun experience in its own right. Our guide, a local Cajun man who was born and raised on the bayou, did a great job not only explaining the ecosystem, but spotting wildlife: even though we were traveling in winter when alligator spottings are rare, he still managed to find us a small one to check out! My personal favorite part of the tour came near the end: we got to hold some baby alligators belonging to a local rescue, and while I would never want to meet one of them once they’re all grown up and released (they’re released once they’re old enough to have a reasonable chance to survive on their own), they were very entertaining in the meantime. With only 3 days in New Orleans, we definitely recommend a combo tour to get you out to both a plantation tour and a swamp tour efficiently in one day! We booked a tour similar to this one at the very last second in person, and ended up paying about 30% more than the price listed on Get Your Guide as of the time of writing. If you’d prefer to visit a specific plantation or ride in a specific type of boat at the swamp (there are a few options), be sure to confirm the schedule for the day before booking. Begin in the Garden District. 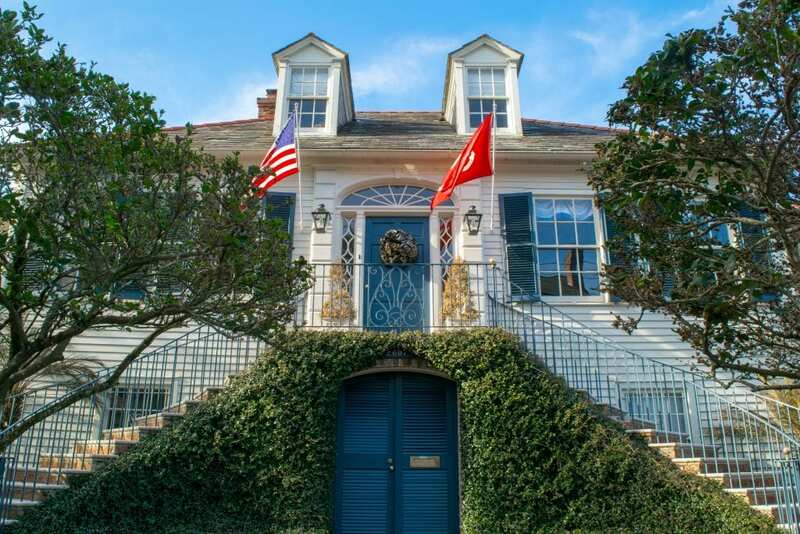 Home to New Orleans’ moneyed elite (and more than a handful of celebrities), the Garden District is the perfect place to walk around and gape at gorgeous homes. Whether you’re in search of Hollywood filming locations (the coven house from American Horror Story is here), familiar facades (the inspiration for the Haunted Mansion in Disneyland calls this neighborhood home), or celebrity homes (Sandra Bullock, John Goodman, and Anne Rice have both lived here, among others), or you simply want to enjoy the architecture, there’s plenty to love about exploring the Garden District. 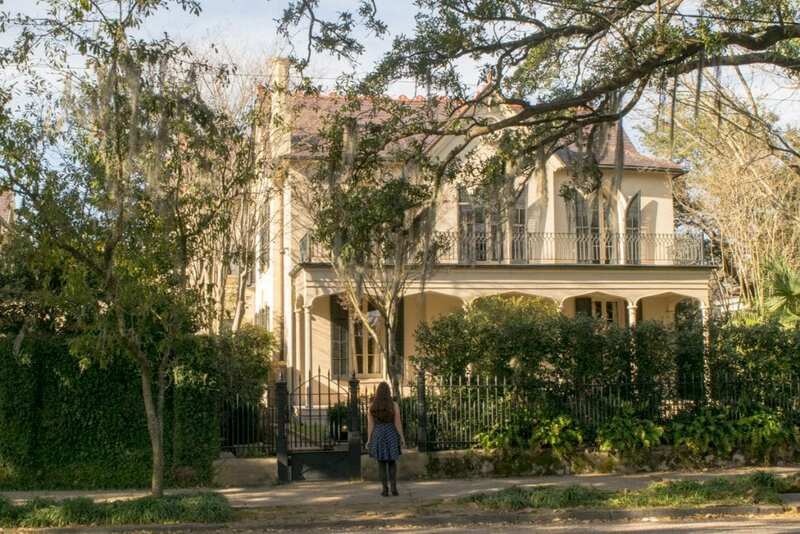 We took a self-led walking tour, simply exploring with a list of remarkable locations in hand, but if you’d prefer to have a guide pointing out the best spots, walking tours of the Garden District are also available! Explore Lafayette Cemetery No. 1. 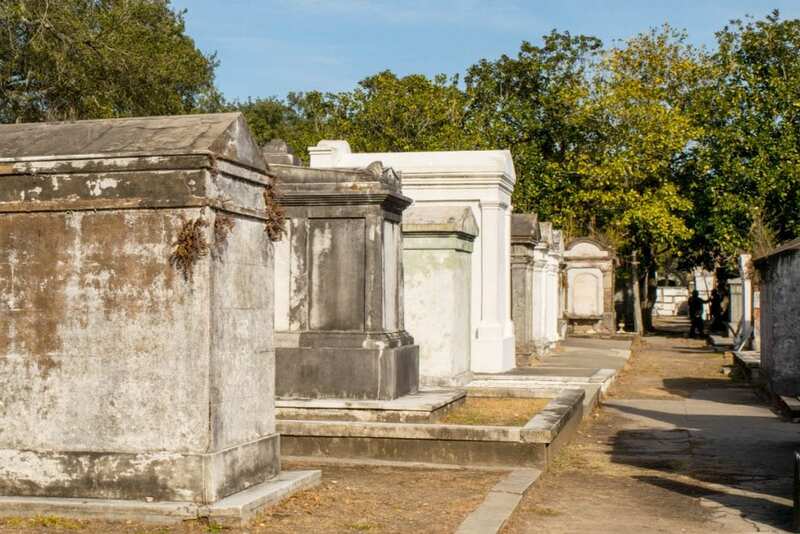 Set in the Garden District, Lafayette Cemetery has plenty of claims to fame, including being the home of the tomb that inspired Anne Rice when designing Lestat’s tomb, and recently playing host to the film crews from The Originals and NCIS: New Orleans. Even without these claims to fame, though, Lafayette Cemetery is still worth a visit: New Orleans’ cemeteries have a unique look with their above-ground tombs that are fairly uncommon in other places in the USA. Like the Garden District, it’s easy enough to explore on your own, but if you prefer to have someone give you the details while you walk, tours are easy and inexpensive to book! Shop Garden District & Lafayette Cemetery Tours! Funky costume shops and tasty restaurants: what could be a better combination? 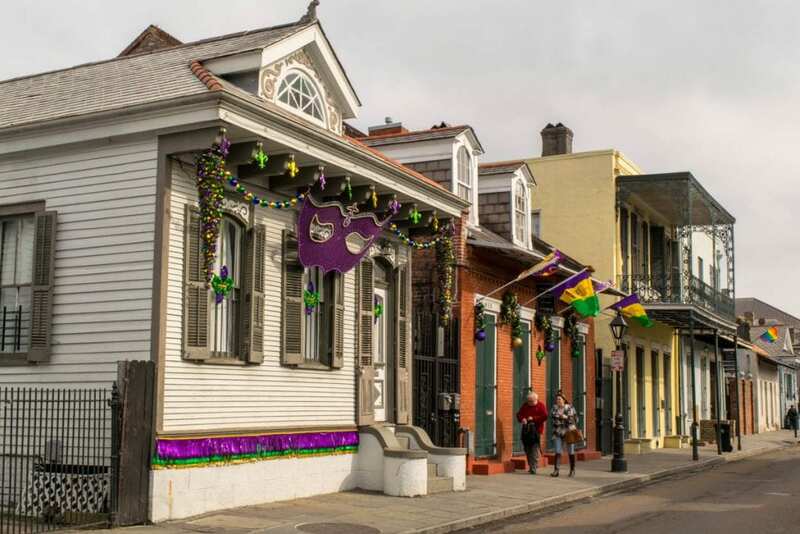 Magazine Street is a great place to grab a meal (we loved the Red Dog Diner) and then duck into some shops to check out Mardi Gras costumes, eccentric souvenirs, antiques, and more! Spend the evening on a ghost tour. We love ghost tours, and can easily say that our New Orleans tour was among the best we have been on! Like Savannah, New Orleans is home to enough ghost stories that no two tours are likely to be the same, and almost all the stories are enough to raise the hairs on the back of your head even without believing in the supernatural. We booked our tour through Get Your Guide with French Phantom Tours, and ended up with Evian who is among the best tour guides we have ever had anywhere–seriously, the guy is a born storyteller (not sponsored, we just really liked him!). We definitely recommend taking the latest tour at night if possible–the crowd will skew older, and the stories likely scarier. Since this is New Orleans, of course there’s an added bonus: no open container laws means that you get to drink on the tour, and if there’s ever a walking tour to be a little bit tipsy on, it’s a ghost tour! Reserve your spot on the Ghosts & Vampires Walking Tour! This tour does sometimes sell out, especially during high season–we were only one person shy of a full group on a cold night in January, so book early if you can! Also, be sure to arrive at the meeting point a little early–as of the time of writing, 2-for-1 Hurricanes are available at the bar up to an hour before the tour starts as part of your ticket. Say goodbye to New Orleans on Bourbon Street or Frenchmen Street. Still have energy after your ghost tour? Of course you do, you’re in New Orleans! On your last night in the city, give it a classic New Orleans goodbye by heading out for a bit of nightlife: travel to either Bourbon Street or Frenchmen Street–either whichever one you didn’t hit up on night one in New Orleans, or stick with what you know. Whatever you choose, you’re bound to say a great goodbye to your 3 days in New Orleans. Jambalaya, red beans & rice, po’boys, muffulettas, gumbo, beignets, boudin… New Orleans cuisine is like no other place in the world and should feature heavily on any New Orleans itinerary. With heavy African, Caribbean, Spanish, French, Native American, and even occasionally Italian influences (quite the list, right? ), New Orleans has long been known as a city worth eating in, with very good reason. We’re far from food experts on New Orleans, but we’re happy to share what we thought of the dishes and restaurants we got a chance to try (primarily in the French Quarter, as that’s where we stayed), and to let you know what’s still on our wish list for next time. We made a beeline straight for Coop’s Place after getting into New Orleans: Willie Mae’s was closed, and this was supposed to be the next best thing for fried chicken! Well, the fried chicken was terrible (and we’re not picky–hopefully we just caught them on a bad day? ), but the sausage and rabbit jambalaya, coleslaw, and cheese fries were amazing. We’d definitely go again… but we’d skip the fried chicken and head straight for the jambalaya. You never quite know if something as hyped up as Cafe du Monde is going to live up to the legend… but oh my, these beignets ever do. 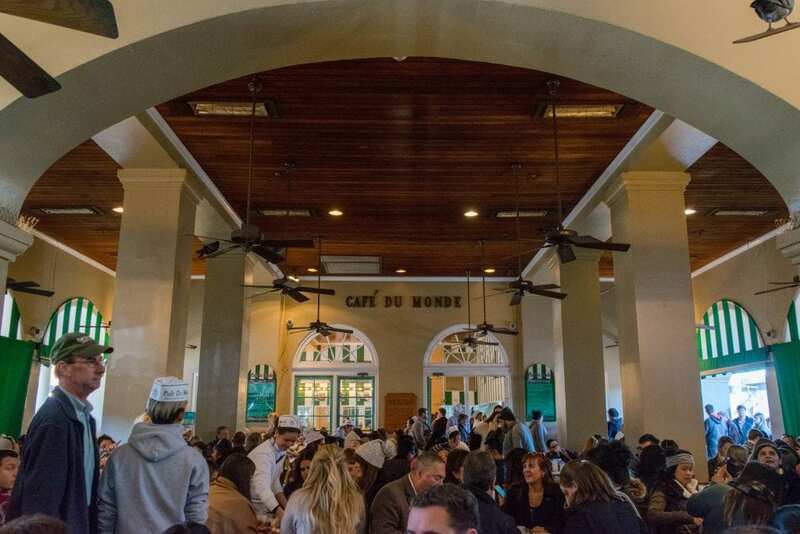 Fresh, delicious, and not remotely nutritious, Cafe du Monde deeply embodies New Orleans’ spirit of indulgence–and let’s just say we indulged roughly every 48 hours that we were in the city. Quick logistical note: Cafe du Monde is cash only. Including tax, a plate of 3 beignets and a drink costs $6.00 USD, and there’s an ATM inside a tourism office across the street. We ate our first po’boys here, and all we can say is yum. The sandwiches were solid, and the hush puppies were absolutely delicious. We didn’t leave with the impression that this was an unmissable culinary experience in New Orleans or anything like that, but we enjoyed the food and would say it’s a solid option on the tourist trail with plenty of New Orleans’ favorites on the menu. On one night we were in New Orleans, we were on a quest for a bar on Frenchmen Street with great live jazz that also served decent food… and we ended up at Bamboula’s. The “boat” (oversized po’boy) and Caesar salad were good, the fries and burger were excellent, and the drinks were tasty and reasonably priced–we would definitely go back. What happens when you combine delicious Italian bread, all kinds of salamis, meats, and cheese, and top it all with the most wonderful olive spread we’ve ever tasted? Italian inspired (and invented by the Sicilian immigrant who opened Central Grocery in 1906), the muffuletta is the only prepared food item on the menu at Central Grocery, which still looks remarkably like a small Italian grocery store when you walk inside–if you happen to be in the market for olive spread, mascarpone cheese, or cannoli shells, you can pick those up here along with the sandwich. 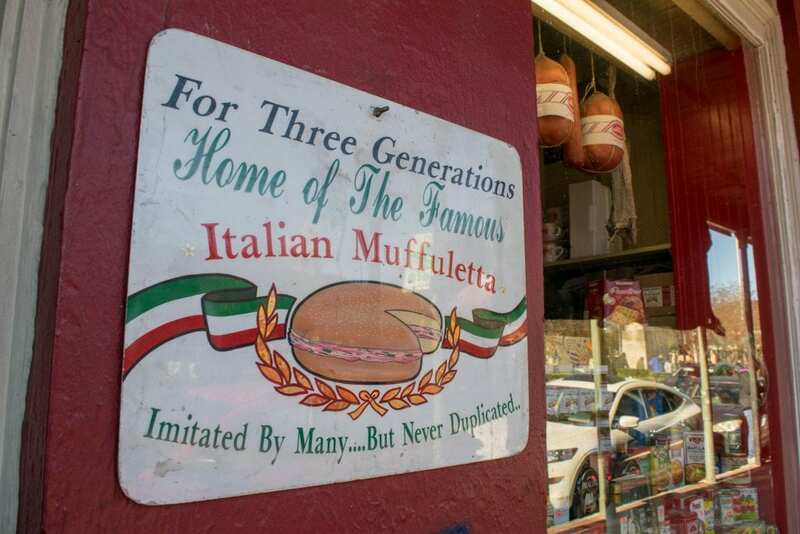 Muffulettas are big–half of one fed Jeremy and me both–and are absolutely unmissable during 3 days in New Orleans. Walking down Magazine Street after our self-led tour of the Garden District, we had no plan for where to eat… so we settled for googling reviews of places that we walked by that looked appealing. It didn’t take long for the Red Dog Diner to emerge the winner. Cute restaurant, reasonable prices, great reviews: we were sold. The food was even better than we expected: from the smoked gouda mac’n’cheese (SO good), to the giant plate of parmesan chicken that was twice as big and twice as tasty as we expected, to the absolutely decadent banana pudding, we chalked the Red Dog Diner up to an easy food win. 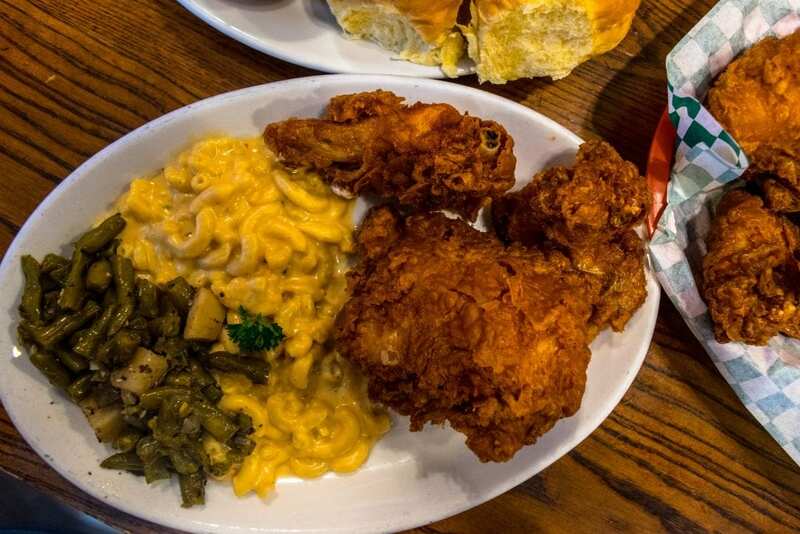 Incredibly famous (and Food Network featured) Willie Mae’s sits just a few minutes by Uber outside of the French Quarter, and is well-regarded as the place to get fried chicken in the Big Easy. While prices are high by local standards ($15.00 for three pieces of chicken and one side, and we highly recommend adding a corn muffin onto that for $0.75), it’s worth the experience to try their amazing chicken once while in New Orleans. The chicken was delicious, as were the corn muffins. The rest of the sides were solid-to-mediocre (we tried green beans, mac’n’cheese, sweet rolls, and corn muffins), but let’s be real: you’re there for the chicken anyway. The restaurant is small and has strange hours (10am-5pm, Monday-Saturday), so plan to wait in line outside before getting in. We didn’t wait more than 20 minutes on a beautiful day, but if you’re traveling during the on-season, word on the street is that the earlier you arrive, the better: show up by 11:30am for best results. This 24-hour diner on Bourbon Street is tiny, adorable in that old-fashioned Americana sort of way, and utterly unpretentious. Their goal is obvious: feed the drunk people. Prices were some of the cheapest we saw in New Orleans, and the food was solid–not a culinary experience to write home about, but nothing that we regretted sitting down to either. We wouldn’t mind stopping by again for biscuits and gravy the next time we’re in NOLA! We aren’t the biggest oyster fans in the world, so didn’t make Acme a priority, but it was recommended to us several different times on our trip! If you’re into oysters, don’t miss this place. Home to just about any type of gumbo you can hope for, we’re told that this the place to indulge in gumbo while in New Orleans! Slightly toward the pricey side, Cafe Amelie serves up classic New Orleans cuisine in a romantic, elegant atmosphere. The food is said to be wonderful, as is the simple experience of eating in their courtyard on a pretty day. The menu is not static, and reservations are encouraged, though not required. 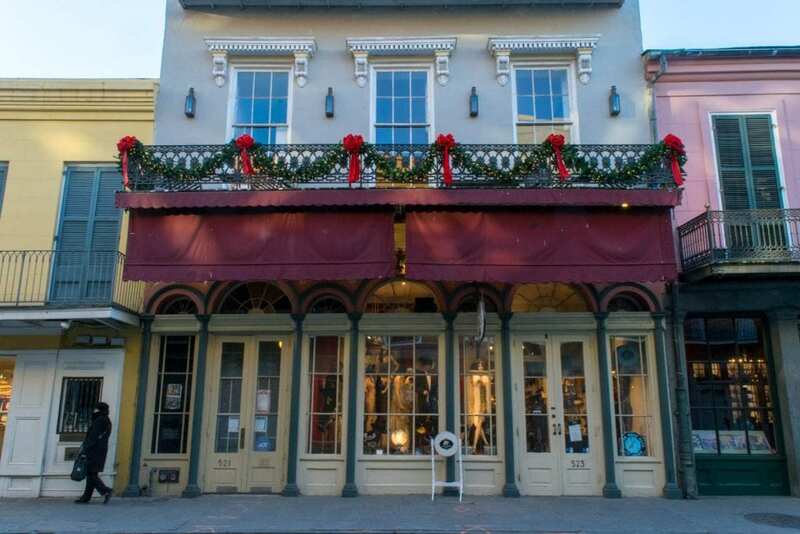 Located in the Garden District, Commander’s Palace is one of New Orleans’ finest and most famous restaurants. You’ll need to plan ahead, as Commander’s Palace does have a dress code, and reservations are needed. While pricey, the $0.25 martinis during lunch (yep, you read that right!) will help ease the bill a bit! Similar to Cafe Amelie and Commander’s Palace, Antoine’s is an upscale New Orleans’ staple for those wanting to experience classic New Orleans cuisine (Antoine’s focuses on French-Creole dishes) in an absolutely beautiful location. Antoine’s is still owned and operated by relatives of the original founder from 1840, making it a restaurant with a strong legacy. Personally, we’d love to visit for the jazz brunch! How would you like to dine with a ghost? At Muriel’s, it is said that their resident ghost (the spirit of the man who once owned and lived in the building) only stays calm and non-disruptive if they set a table, including a glass of delicious French wine, out for him every night–and for a fee, you’re welcome to join him! If dining with the dead isn’t your thing, the gorgeous dining room and Creole cuisine may still entice you to visit! However many days you have in New Orleans, that’s the perfect amount of time to spend here! That being said, 3 days in New Orleans is the perfect amount to get an overview of the tourist highlights while also leaving enough time for rest that you don’t end up utterly exhausted and skipping tours to sleep by the last day of your trip. The good news? That means New Orleans can be done in a long weekend! The bad news? You’ll have to keep your nightlife hours vaguely reasonable to make sure you have enough energy to see all the highlights during the day. If you’re lucky enough to have more than 3 days in New Orleans, there are dozens of other things you can do: visit the famous WWII Museum, hit up the Pharmacy Museum, visit City Park, or work your way through New Orleans’ best independent bookstores like we spent a day doing! You can also consider a visit to Mardi Gras World to see incredible Mardi Gras floats throughout the year, visit St. Louis Cemetery No. 1 for some famous gravesites, duck inside the St. Louis Cathedral, and take any number of tours about the city’s history or contemporary culture. Personally, we have an eye on a Katrina Recovery Tour during our next visit–we had hoped to squeeze it in this time but didn’t have time for it. Even with the random and very unusually severe cold snap we experienced in New Orleans (highs in the 40’s F on a couple of days–so not a real cold snap for most of the world! ), we still believe that January was one of the best times we could have visited New Orleans! The city was very quiet, with the Christmas season over and the Mardi Gras season just barely getting underway, we didn’t have to deal with the oppressive heat that comes with a New Orleans summer, and the crowds of Mardi Gras and the spring season hadn’t set in yet. If you’re not interested in braving the winter, spring is the most popular time to visit New Orleans–just try to arrive before the heat does! While Mardi Gras is supposed to be an incredible experience, only plan on going to New Orleans then if Mardi Gras is your purpose of being there–the crowds, prices, and businesses will all revolve around the festival. Unless you’re planning on road tripping in for your 3 days in New Orleans, do not rent a car to explore the city–you’ll end up spending way more than necessary, we promise! Parking generally costs a pretty penny for a southern US city here–we saw multiple garages around $40-50/day, and you’ll very rarely need a car in New Orleans. We stayed on the edge of the French Quarter, and walked almost everywhere. 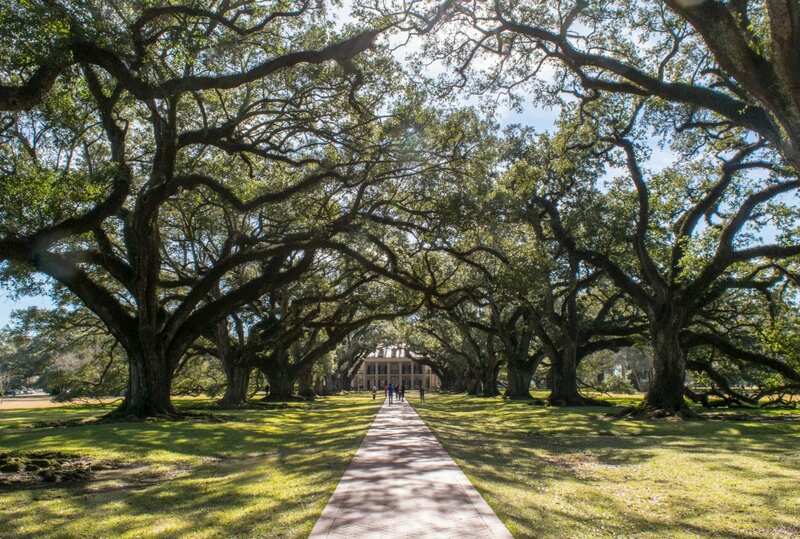 The exceptions: we took Ubers to and from the Garden District/Magazine Street, Willie Mae’s, and the airport, and we took a guided tour out to Oak Alley Plantation and the bayou. The tour was a bit expensive, but compared to the cost of renting and parking a car in New Orleans, it was a bargain! Public transportation in New Orleans is limited and not incredibly reliable, but there is a bus system and a limited streetcar system if you’d like to give them a try. Best Western Plus French Quarter Landmark Hotel — We LOVED this property! The hotel itself is beautiful in that classic New Orleans way, and the (included) breakfast is varied and tasty. 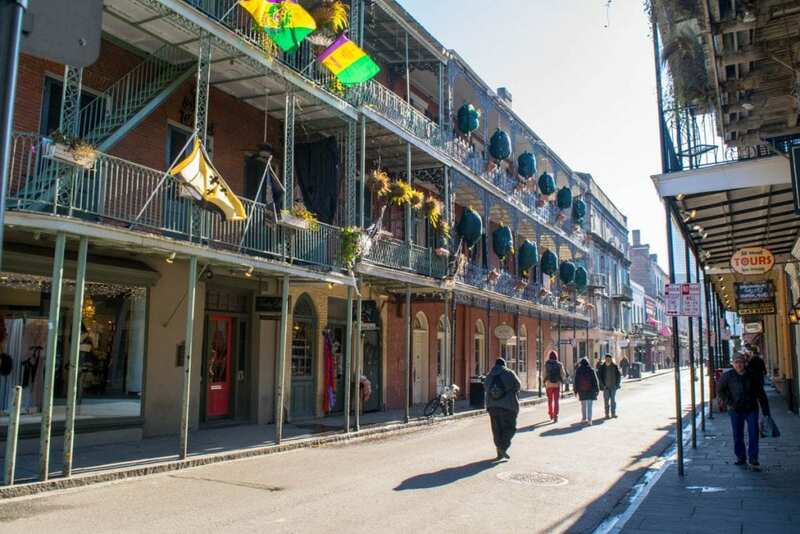 Best of all, this hotel is situated right on the edge of the French Quarter, meaning that all of the French Quarter and some areas beyond are within easy walking distance. For the price, it’s hard to imagine a better deal in New Orleans, and we absolutely plan to stay here again when (because it is when, not if) we return to New Orleans. This was a perfect read for me, as I’ve never been to New Orleans. Cafe du Monde and those beignets sound delicious, I’m seriously drooling right now. I’d never think of visiting a plantation either, but after you saying I should include it on an itinerary, I will re-consider it. Waaaa you touched a tiny crocodile! That beign said, I loved this guide! It is super complete and fun. Especially because I have never been to New Orleans, but I am planning to do so in the future. I would love to visit the French Quarter and eat all of that amazing food! Thanks for all the tips! I’m bookmarking this for future references! If there is one city in the US that I want to visit, it’s New Orleans. This city has intrigued me so much but this post has opened my eyes that there is more to this city than I fell in love with. I have also heard so much about Cafe Du Monde. Apparently, I can’t afford to miss that! No, you definitely can’t! And I would say New Orleans definitely deserves to rank among the top cities in the USA worth visiting–it is a very unique place. My 3 sisters and I have started going on a trip each year a couple years ago. While we were trying to decide where to go this year, one sister suggested New Orleans and did some digging. That’s how she came across your blog. We have exactly 3 days to spend there too. So thank you so much. We’re looking forward to the plantation tour and boat ride. Is course to taste all those yummy food that you mentioned as well. Thanks again for your help. So glad we could help, Penelope! I hope you and your sisters have an incredible trip. We went to Gasparilla this weekend, which is kind of like a pirate themed Marti Gras in Tampa. It made us think that too much drunken tomfoolery might not be in our wheelhouse. Seeing your three day itinerary to New Orleans has renewed my zeal for the city. Eating my way through the city has always been high on the list but that ghost tour looked like a lot of fun as well. We’ll have to go soon and check it out for ourselves. Oh yes, New Orleans goes way beyond the drunken debauchery! That’s not really our thing, either–part of the reason we kept pushing it back–but NOLA would be worth visiting even if the nightlife didn’t exist. I have been wanting to go to New Orleans for half my life. I even have a list of things to do… visit Bourbon street, the cementery, eat a beignet in Cafe du Monde… I am so jealous! Although it is very nice knowing that you can squeeze so very much in only three days! I hope you get to go soon! We had wanted to go for ages as well, and now we’re kicking ourselves for letting it slip by for so long–we’ll definitely be back again. Lovely post! This is a perfect guide for first timers in New Orleans. The itinerary covers everything – the landmarks, history tours, plantation visit, night life, food and a lot more. Food looks and sounds yummy with all your delicious descriptions. Ghost tour- really? That sounds fascinating! It’s funny–ghost tours are pretty common in the USA, but I feel like only some places “deserve” them, or know how to do them right, lol. NOLA definitely makes that list! Very well spent 3 days in New Orleans! I am in love with those colorful facades. The grilled exterior of Commander’s house too is stunning. French Quarters too look charming and is worth a photo shoot. I might need more than 3 days for such a wonderful place. New Orleans is a beautiful city with vibrant streets and colorful houses. I would love to go around Bourbon street which is designed according to French style. And would love to eat in Central Grocery which is running from 3 generations. Exteriors of Commander’s Palace is very elegant and beautiful. New Orleans is very photogenic. The architecture of the cathedral is so beautiful. New Orleans sure look like a trendy place. The café and the colorful streets are evidences. I am a wildlife enthusiast but would love to observe the alligators from a distance. Loved this blog. From a distance is a good idea, lol! I loved holding the young ones, but the adults can stay far away as far as I’m concerned! Love it! I know I spoke with you on instragram and am so glad I stumbled upon this! Can’t wait for my trip out there in May! Thanks for the great info! Aw, thanks so much, Madison!! I hope your trip is amazing. 😀 If you get the chance, definitely reach out this spring and let us know how it goes! Great blog – thanks for the tips! New Orleans has been on my bucket list for a long time! The ghost walking tours sounds so good! Thanks, Francesca! The ghost tours really are a blast. All that food looks so delicious! New Orleans is so easy to get around in without a car and it’s great that you stressed that for the first-timers who aren’t sure. Thanks! I know, the food is amazing–I miss it all over again whenever I see photos lol. I enjoyed your travel tips for 3 days in New Orleans. I think the suggestions you made are exactly what I have in mind. We are retired couple in our 70’s but still feel young enough for wanting to have a good time…drinks…great music and fabulous food! I have a bit of mobility problem …I walk slow…..and can’t walk too far. So…probably best to stay by French Quarter…right?? Will look into the hotel you mentioned! I hope all the self- walking tours would not be too much for me. Maybe…. a tour of homes would be fun! !….& for sure, a Plantation tour would be very interesting. Now to figure out best “quiet” date that won’t be too boring!! We are not interested in wild partying time of Mardi Gras… but do not want to feel like we are in a morgue either! Also would be happy to save on hotel rates, food, etc. So…off season should be best for us!! Now to check air fares! Thanks for your help!! With mobility issues, yes, definitely best to stay in or very close to the French Quarter. The Quarter itself still includes quite a bit of walking, so you’ll likely want to feel out how comfortable you are with it once you’re there. If needed, Uber is popular in the area! For quiet but not a morgue, we really did enjoy our trip in January–not too cold, not deserted, but far fewer crowds than when Mardi Gras truly heats up. I hope that you guys have an amazing time!! I have visited new Orleans recently and I love the experience, especially visiting Cafe du Monde was the favorite part of my trip as its restaurant menu covers offers best food. Cafe du Monde is delicious! Love their beignets. My husband is a native Cajun who grew up just an hour south of New Orleans & when we first met (25 yrs ago), he took me to the tourist spots as a teaser, then gave me a “real” taste of NOLA for our honeymoon by taking me to the not-so-touristy places & we have been doing NOLA every year since. If you don’t want to wait in the rediculously long line at Cafe Du Monde just for a yummy beignet, head over to Cafe Beignet on Bourbon Street. The service is just as warm and in my opinion the treats are a little more tastey. Brennan’s on Royal Street is also a great breakfast spot. If you enjoy art like we do, please take time to visit the many galleries around town. The art varies greatly from folk to classic & there are also many sidewalk artists that are absolutely amazing. Commander’s Palace is an upscale farm to table dinning experience that’s “modern New Orleans cooking meets Haute Creole” (reservation & dinner jacket required). Antoine’s Restaurant is also a wonderful experience and is considered America’s oldest, dating back to 1840 & is a winner of the coveted Lafcadio Hearn Award (reservations suggested). For a real taste bud experience, there are also New Orleans cooking classes & food walking tours. Swamp tours are a dime a dozen here so shop around & don’t be afraid to drive away from NOLA for this experience. Airboats are fun, but they are LOUD. Though you may see lot’s of swamp, you aren’t going to see a lot of animals as they are scared away by the noise of the air boats (some more than others). To get the up close & personal experience see if the tour company has the smaller outboard motor boats. I personally enjoy the quiet educational aspects of a swamp tour, but some tours can be very hokey, so ask the locals and READ the REVIEWS. Also take time to read NOLA rules/regs. As mentioned before by others posting here the city of New Orleans lacks strict open container laws, but it does require people who drink alcohol on sidewalks and streets to do so only from plastic cups – NOLA also prohibits drinking alcohol in a parking lot. Drinking while Driving is prohibited. There are quite a number of drive through daiquiri shops and they will place a strip of tape over the straw hole. Please note that if you are caught driving with a straw through the lid of your cup, that container is considered “open”. Here’s an odd rule for “fancy biking”. New Orleans is as flat as an ironing board and has lots of side streets, making getting around by bicycle a great option. If you rent one for your stay, remember: No fancy bike riding. The law: “Every rider of a bicycle, tricycle or other vehicle propelled by hand or foot must keep at least one hand on the handlebars of his machine when riding it.” Good work Mrs. Storm & thanks for reading. Thanks for writing in! Always fun to hear about the inside tricks & quirks of different places… and New Orleans, of course, is one of the quirkiest of them all. 😉 We’d love to make time for Commander’s Palace on our next visit, there was just no squeezing it in this time! Just come across this 3-day itinerary – very useful. My daughter and I will be there from UK for 3 days end of Feb celebrating her 21st birthday. Sounds like just the sort of things we want to do, along with enjoying some of the Mardi Gras parades. Just hoping it won’t be too busy to enjoy wandering around the French Quarter. Oh, how wonderful! Sounds like an excellent way to spend a 21st birthday. If you’re going during the Mardi Gras festivities, you’ll definitely see some heavier-than-usual crowds, especially around popular spots like Bourbon Street. On the day you did the plantation and swamp tour where did you eat since it was out of the city? Any tips on safety in New Orleans? I’ve heard from friends that live there that it is legitimately unsafe in some parts at night. I’m going with a decent sized group of friends (5 or more), so I figure staying in a group, not staying out too late, and remaining in touristy areas, would be fine. Any thoughts? How about suggestions for neighborhoods for Airbnbs? I agree with your plan–sticking to touristy areas and staying with a group is a great way to stay safe. We never felt unsafe during our trip to New Orleans (and we have friends who live there and love it), and like in most major cities, the areas where crime is a significant risk and the areas that tourists are interested in visiting don’t have much overlap. The only other thing I’d suggest is taking a cab back to where you happen to stay out very late at night and have a long walk ahead. Airbnb use is actually extremely contentious in New Orleans, more so than in most cities in the world, and isn’t allowed at all in the French Quarter and Garden District. 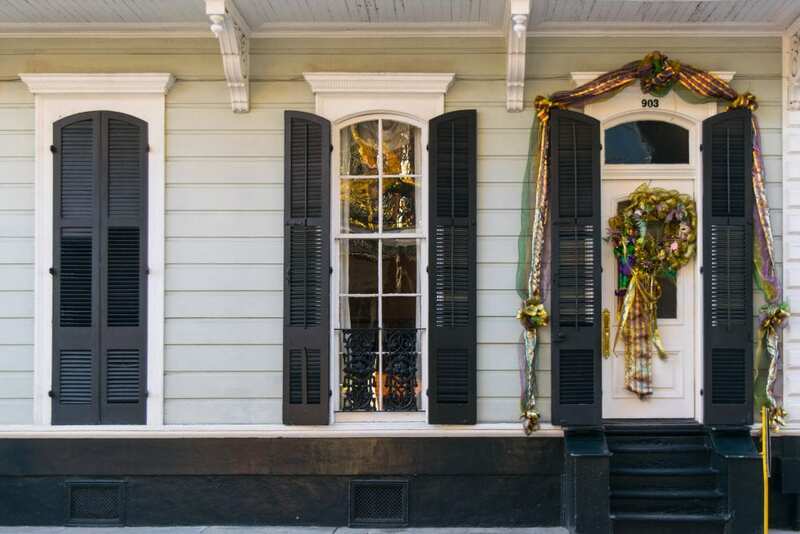 We’d recommend skipping an Airbnb entirely in New Orleans and opting for a hotel or B&B instead. In or right next to the French Quarter would be our first choice–we loved the Best Western we stayed at on the edge of the French Quarter!